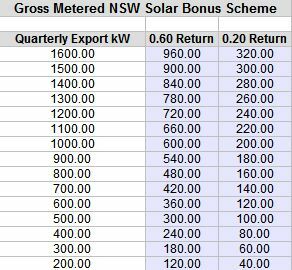 Some NSW Solar Bonus Scheme homes are about to get a nasty POWER BILL SHOCK! As their first electricity bill of the year is due, since the closure of the NSW Solar Bonus Scheme. Where the majority of homes were getting 60 cents for every kW exported! With Gross metering now gone and Net metering being applied, there is going to be a dramatic financial drop of revenue in the first quarter and thereafter for many of these households. So for those of you whom want a quick heads up on what to expect, at Aussie Home Energy we have done the basic maths. Maths to help you see what financial return you can expect, when you are using more or less of your net metered solar power. The concept of Net metering can be foreign to many people, when they are simply used to being paid for all solar power sent back to the grid. We hope this data table helps you realise with Net metering you need to use more of your solar power. As an example the maths is based on excess solar power being sent back to the grid for ONLY 6 cents per kWh. And imported power costing 25 cents per kWh. No one will argue that from 60 cents to 6 cents is a large drop for power sent back to the grid. Even if the householder was to use 100% of the net metered solar power [extremely unlikely for Mr. Average], then there is still going to be a 41.5% drop in solar investment return, when compared to the NSW Government's recent 60 cent Gross scheme. If you were on the 20 cents per kW Gross FIT then the difference is not that bad. But for the 60 cent per kW Gross FIT households, there certainly will be plenty of 'Power Bill Shock' causing unwanted financial pain! Not forgetting as the scheme has run for around six years most of these 60 cent householders will have forgotten, what a normal electricity bill is! As they have simply got used to the solar power credit added to each bill. So to help you to get an idea of the financial return to expect when being Net metered, we have created a simple data table HERE. Now that is 90% less of any recent quarterly SBS 60 cent Gross return that you are used to gone. This 90% less is for those homes now sending 75% of the power back to the grid! Check the maths! Obviously different tariff rates will affect our maths, but hopefully you will get the picture! Now it is not all that bad if you can control your appliances, as this will allow you to use more of your solar power and offset imported power costs. And that is how you make money with a NET metered Solar System. Yes you make more by offsetting imported power costs! There are a few appliances in many homes that can be programmed or simply controlled by a timer to use up some of that excess solar power.